In this chapter, the features of the classic form of hanezeki are explained, and its mapping to Igo Hatsuyōron is described. This is the classic example of hanezeki. Neither Black, nor White, will profit by resolving it. 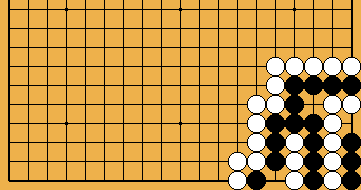 White's stones on the outside are assumed to be independently alive.